Weather conditions have to be perfect for an outdoor curling match – cold, still and icy. Last winter, for the first time in seven years, Naseby delivered. Guy Frederick captured the action. As the Milky Way surrenders to the dawn light, marking the end of the coldest night of 2017, truck headlights from around the Maniototo converge on the outskirts of Naseby. Twenty-four hours earlier, a flurry of phone calls spread word of the Centennial Ponds’ perfect conditions, giving the green light for the traditional President’s Cup curling match to proceed. 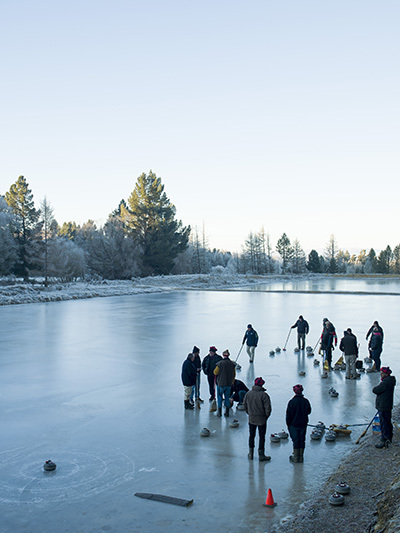 Hand-knitted jumpers, tartan tam o’ shanters, Red Bands and 20kg curling stones tumble from the vehicles for a day of camaraderie on the ice under Central Otago’s translucent skies. 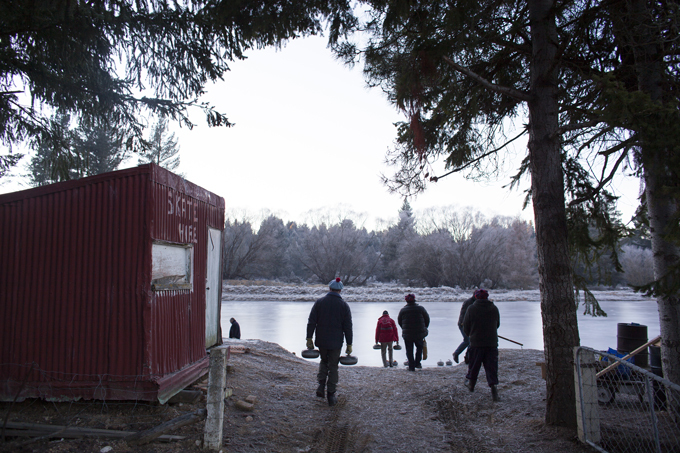 Naseby “Icemaster” Jock Scott describes the conditions as something “to be proud of” following the -11°C night. “Putting perfect ice together is fundamentally about science and compassion,” he says, between gulps of strong, leaf-brewed tea. Scott had his first game of curling in 1966 and is four generations down from the Scottish settlers who first brought the game here over turbulent oceans. In the early days of curling, it was regarded as an honour to belong to a club and there had to be a damn good reason (along the lines of near-death afflictions) for not turning up to a match. A century and a half later, the rules have relaxed a little, but those who do play are well versed in the histories and traditions, the etiquette and the error of their ways. Clubs are given 24 hours’ notice of the Naseby Curling Council President’s Cup match held, when conditions allow, on Naseby’s Centennial Ponds. Traditionally played on natural ice, last year’s match – featured here – was the first since 2010, highlighting the vagaries of climate and the changing nature of the ice in a region known for its blistering summers and chilly winters." Above left: Born-and-bred local Jock Scott first gave curling a go in 1966. As president of the Naseby Curling Council in 2017, he was pleased to announce the President’s Cup match would take place, before the end of his three-year term. Above right: Hamiltons Club’s Tuck Hapuku acts as the team’s skip, using his broom to signal the best line to the next curler. 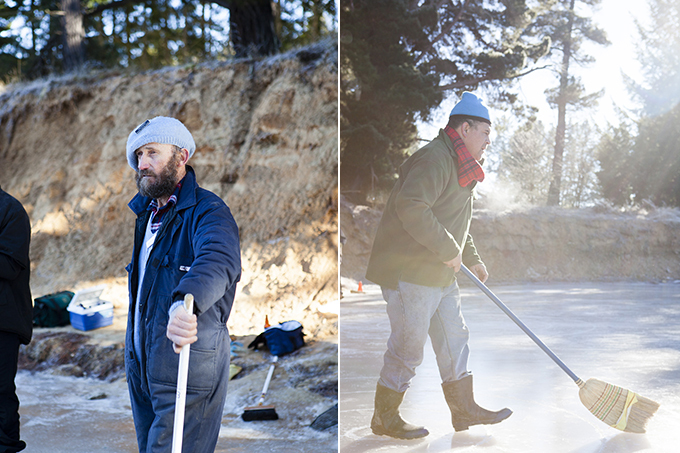 Essential curling tools, brooms are also used to furiously sweep the ice and assist movement of the 20kg granite stones as they glide over the pond’s surface." 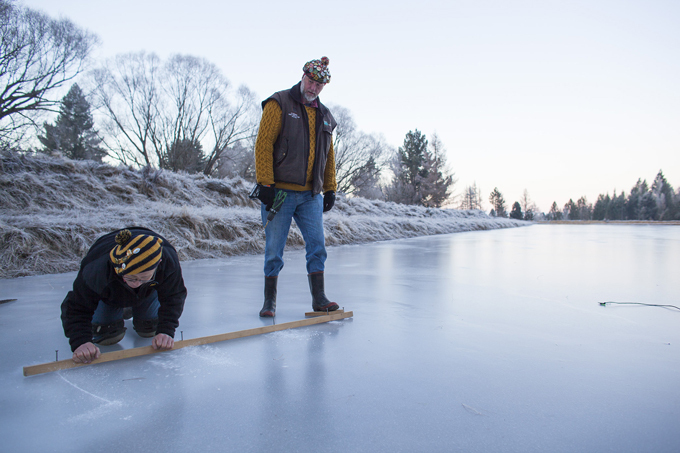 In the pre-dawn light, Steve O’Malley (kneeling) and Wilson Wahrlich help prepare the four curling rinks, marking out the “pot-lid” as the central target and its surrounding concentric circles, which act as guides for the curlers." 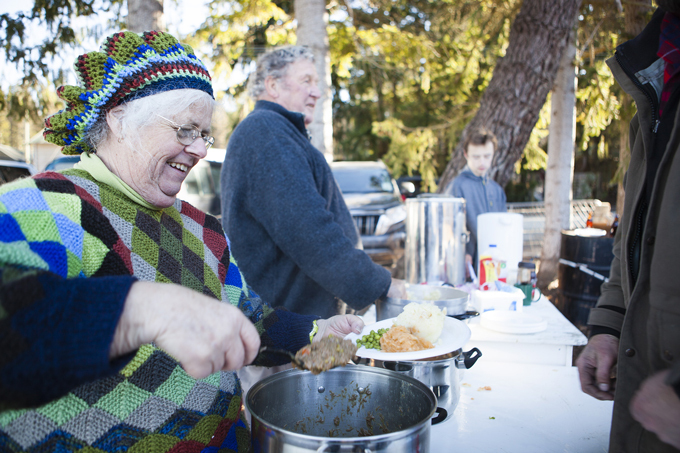 On the sideline of the Centennial Ponds, Karen Munro serves the traditional lunch of beef stew, peas, mashed spuds and swedes. The hearty and warming lunch signals the mid-point of the match and prepares the players for another 21 ends of curling in the afternoon.